Homeowners in Ox Bottom Manor are seeing a lower and slower housing market than what they are used to. 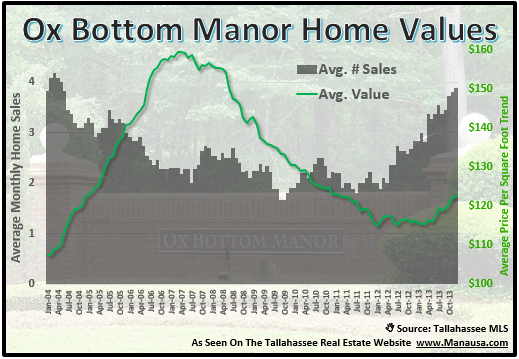 That is no big shock, but I do find it surprising that home sales in Ox Bottom Manor are even slower then many of the other NE Tallahassee neighborhoods. Ox Bottom Manor has recorded fewer than 20 sales per year since 2008. As a very popular Northeast Tallahassee subdivision that was used to seeing more than 40 home sales per year prior to the boom of the housing market, a reduction in the home sales rate by more than 60% is not so good. But I have found the culprit, the reason why Ox Bottom Manor is slower than "everybody else." It's because the homeowners in Ox Bottom Manor are holding on to their asking prices. Home values have dropped "only 27%" since the peak of the housing market. Currently, there are 18 homes for sale in Ox Bottom Manor, which is just over a year's worth of supply based upon the past four years rate of sales. Home sales in the Ox Bottom Neighborhoods have picked-up slightly over last year's "worst-ever" performance, but they still are well below one-half the rate these communities would expect to see in normal years. Based upon this current rate of sales, the relative supply of homes for sale in the Ox Bottom neighborhoods is right around 12 months of supply. The average price of a home sold in Ox Bottom Manor last year was $283K, which is down 32% from the $419K average home sales price that was recorded in 2006. The real estate graph below shows that home prices are right back where they were in 2003, but early 2012 sales might be showing that buyers are beginning to scoop up the larger homes. More importantly, the Ox Bottom neighborhoods have seen home values decline 27% from $158 per square foot in 2006 to just $115 per square foot through Mid March, 2012. The real estate graph below shows that this trend is still on a downward path, and home owners who think they are waiting for the return of the market on in for a rude surprise. Home values in Tallahassee have dropped. To attract the historical "normal" number of buyers to Ox Bottom Manor, values will have to fall in line with what buyers can find elsewhere in comparable neighborhoods. 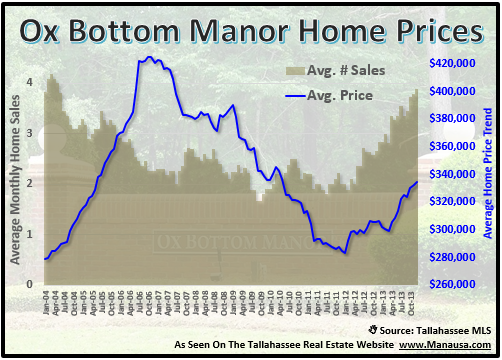 As more home owners in Ox Bottom Manor "give up waiting" in order to move on with their lives, the backlog (pent-up supply) will hit the market and I believe Ox Bottom Manor will equalize with the rest of the Tallahassee housing market. Right now, homes in Ox Bottom Manor are trading (selling) at a premium to the rest of the market, and current sellers would be wise to take advantage of this. Home seller's should expect to get less money for their homes next year than they could receive in 2012. This means that homeowners who are thinking about selling a home in Ox Bottom Manor should either plan to hold onto the home for many more years, or sell it as fast as possible to get the top dollar in a declining real estate market. Check back again real soon for more Tallahassee neighborhood reports, including Ox Bottom Manor.